Gai Bryant is a saxophonist/composer currently living in Sydney, Australia. She has worked locally with Carl Orr, Mark Simmonds, Paul McNamara, Sandy Evans, Jackie Orzaczky, Jann Rutherford, Lloyd Swanton, Janet Seidel, Don Burrows and Roger Frampton and others. 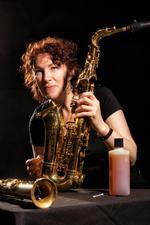 In 1996-7 she studied with soprano saxophonist and composer, Jane Ira Bloom in New York. Upon her return to Sydney she formed the Gai Bryant Quartet. From 1997-2000 the Quartet toured throughout Australia, Korea, Hong Kong and Taiwan performing concerts and conducting workshops. Early 2000 Bryant studied Taegum at the National Korean Performing Arts Centre in Seoul with WON Hyang-Juan, master of traditional Korean music. In September the Quartet toured Korea with WON Hyang-Juan and his family performing compositions by Gai and Won Hyang-Juan for a combined ensemble at the Korean Performing Arts Centre, Seoul. In October/November 2002 Gai Bryant's large ensemble performed with Jim McNeely at the Sydney Opera House Studio and Wangaratta Festival playing McNeely's compositions and arrangements for tentet. In 2005 Bryant composed and recorded the soundtrack for previously unseen Frank Hurley footage of SS Aurora 1911-13 expedition to the Antarctic, which screened at Longest Night Film Festival. She performed with Arkadiy Figlin Trio at the Pori Jazz Festival, Finland and mentored the Sisters in Jazz ensemble. In September she presented concerts in Sweden for an Australian design presentations. In 2008 Gai Bryant worked as a 'musician-in-residence' for Armidale, teaching and directing ensembles for five schools and two regional conservatoriums. In October 2008 she toured with Jim McNeely for the second time performing his music for big band. She continues to perform original material in Australia with her own ensemble and as a guest with overseas groups.